Hagerman Construction, Inc. (HCI) prides itself on diligence, trust, quality service, and integrity. 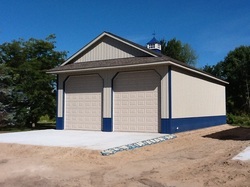 We provide a wide variety of services for all of your construction needs throughout Northern Michigan. With over 27 years of experience we offer you exceptional service that you can count on. Specializing in pole barns for farm, commercial, and residential.